For years I have been dreaming of a trip to Cinque Terre. Every time we think about where we want to go over the school holidays, the 5 T’s always tops the list. 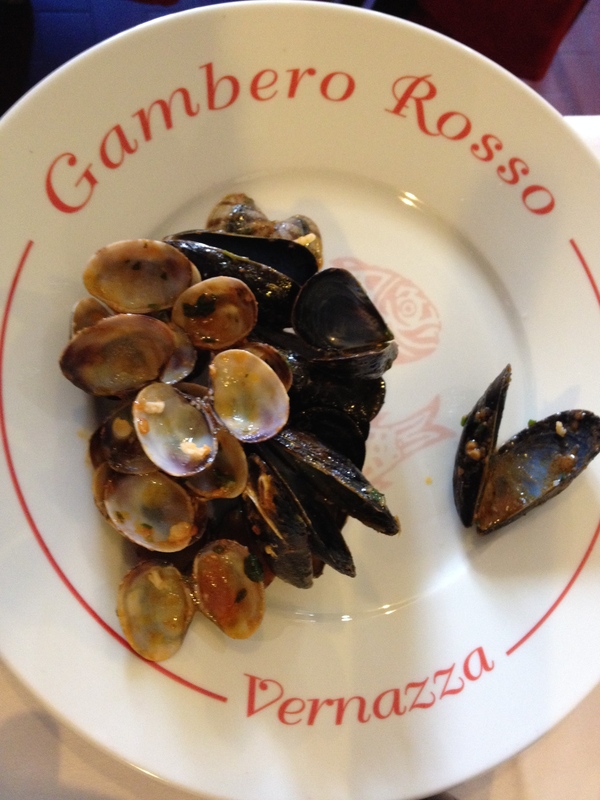 I have read and re-read Rick’s descriptions of where to go, what to see, and what to eat in the Cinque Terre. I have looked at maps of hiking trails. I have searched the web for great places to stay. So many times we have planned on going, and then at the last-minute we change our minds. So this Easter break, I was going to the Cinque Terre. Even though it would just be for the day, I would finally get to see it for myself. I figured it would be more of a reconnaissance trip for where I would want to spend my time on a future vacation. The beauty of teaching at a school in Germany is that I get vacations about every 6-8 weeks. This allows for travels in Europe at off-peak times. On the day after Easter, we decided to cruise around the bend from our home base in Portovenere to the Cinque Terre. Our plan was to go to Vernazza first and then work our way back through the other villages. We were 30 minutes early for the boat. We waited with a small group. As the boat arrived at the dock, so did hundreds of other people. It went from a being a congenial small clump of sightseers, to a large mass of pushing and shoving grumpy Italians. When the boat began to load, it was like being pushed into a slow sucking sieve. As much as you wanted to go with the flow, there was this worry that we wouldn’t make it on the boat. We were first in line, but somehow hundreds of people had pushed their way in front of us. I kept screaming at my child “Don’t let go of Mama’s hand!” The adults around her were literally body slamming her to get around her. Once on the boat I breathed a sigh of relief. That would surely be the worst of this excursion to paradise. The cruise took about an hour. We stopped at Riomaggiore first. Gorgeous! Breathtaking! The colors, the cliffs, the blooming succulents and cacti streamed down the dark rock walls like waterfalls. Then we stopped at Manarola. More brightly colored houses were gripping the rocks in an effort not to fall into the sea. Our captain pointed out Corniglia high up on a mountain peak, as it has no harbor. 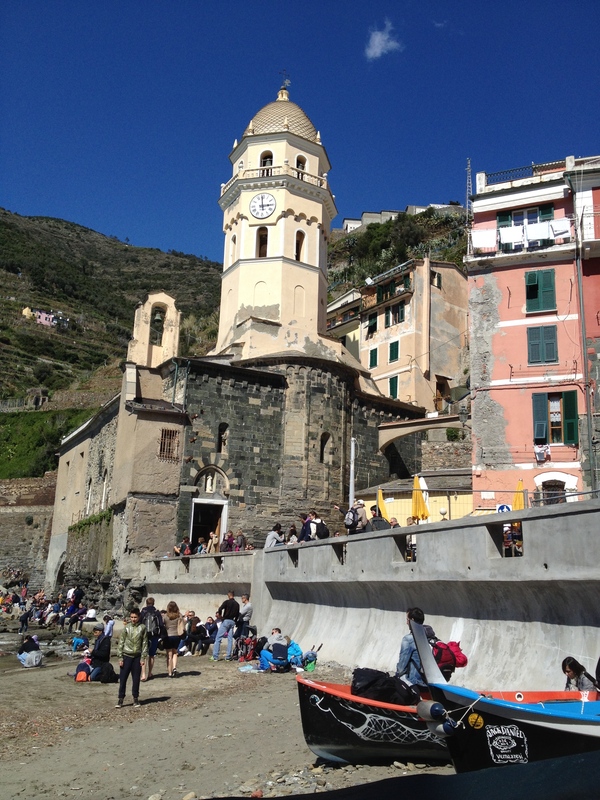 Then finally we reached our destination–Vernazza. Again there was the mad crush to get off the boat. Once sucked out onto the shores of Vernazza we decided to find a place to eat. Unfortunately, everyone else on the boat seemed to have the same idea. This felt a bit like a super competitive game of musical chairs. Find a place to sit before the music stops or you will be out. Every outside table seemed to be reserved. We walked back across the piazza, into a cavernous restaurant, and hoped for the best. The carnage from my spaghetti with clams and mussels. Gambero Rosso, according to Rick is “Vernazza’s most venerable restaurant.” The food did not disappoint, it just took forever to get to us. We arrived to a basically empty restaurant. A few tables had people, a few were reserved, but the waiter graciously offered a table to us and promised to be right back to take our order. There was much running back and forth between other customers. He seated more people. Some he took orders from and brought out bread and wine. But we still sat there patiently wondering when the two minutes he kept promising us would be over. Once we ordered, the food came out promptly. It was probably the best food I had on the entire trip. But I couldn’t get over the feeling that we were being ignored. The Italians were being given good service, we were told “just two minutes senora.” Then again, maybe the Italians were demanding the service. At some point, we decided to just get up to leave, as the waiter didn’t seem to want to take the time out to let us pay. I waited another 10 minutes in a now packed lobby to hand over my credit card. With a full stomach, and feeling a bit more courageous, we wanted to venture out and discover why Rick had called this place “the jewel”. As we climbed our way up through town a train drained itself on top of us, and up from the harbor came another hoard of tourists who had recently disembarked. We were sandwiched in a squeeze play. There was nowhere to go. We made a surprisingly quick stop at Gelato Stalin and then we went to find a rock to sun ourselves on. Too late. There were at least 200 people already doing that on the tiny stretch of the boulder strewn beach. Some had left behind their lunch wrappings. Some screamed at passersby for they thought they were about to get stepped on. My best try at shooting Vernazza to get the least amount of people in the photo. We could take the mobs no longer and just decided to leave. But wait, that means squeezing through the masses and waiting for a boat in a crowd of angry impatient tourists. I didn’t care. Just get me on a boat, any boat, off this crazy rock! We took the wrong boat. It went to Monterrosa. Monterrosa, the place which is the most resort like, actually felt much more calm and welcoming. It didn’t matter though, we were getting out of this place as fast as possible. On the boat ride back I tried to decompress. Deep breathing and the anticipation of tall glass of red wine back at the apartment kept me from losing it. Once home, back in Germany, I grabbed up my Rick Steves’ Italy so I could look for the damning evidence that Rick had led me astray. Then there it was. It was like in those movies when someone is reading something and this special halo of light appears around a phrase. So I guess I can’t blame Rick Steves for the crowds. He warned me that Easter weekend was peak of peak. And I can’t blame him for the “changing tenor of the region.” He hadn’t steered me wrong before. It was all just so maddening, this loss of a dream, this loss of my perfect Italian destination. A panoramic view of Vernazza before the hoards of people rushed the boat dock. Do I try again? Do I go in November to hike the villages? I don’t think I could bear it if I arrived in November to the same amount of screaming hoards. My advice, and I know I’m no Rick Steves, is stay in Portovenere. 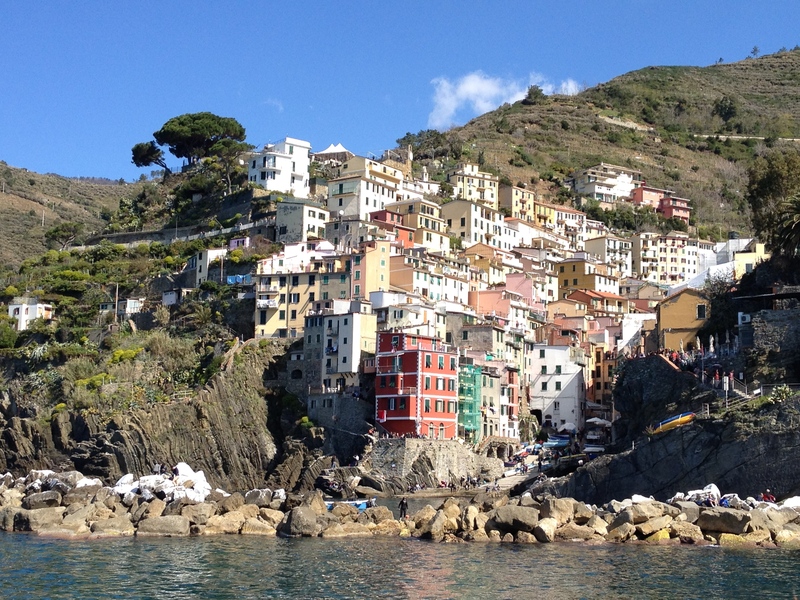 Take a cruise to see the Cinque Terre from the water. Don’t listen to the siren’s song that begs you to go in and explore the villages. Don’t get off the boat! Have you been to Cinque Terre? Did you experience the “lazy life” or the mad crush of people? But being from Seattle, I watched this guy go from having small weekend seminars at UW, to his PBS series, and now the travel giant. I have nothing but respect for this guy. Yet there are times I feel he takes you to touristy, then other places he poo poos for being touristy and they clearly are not. Then again, I have never traveled anywhere but Spain in the summer. Italy might be totally different when all the Americans are on vacation. No doubt he’s a nice, thoughtful guy. I suppose the problem is ultimately that when any guidebook series gets very successful, it is harmed by it’s own success because then everyone is following the same ‘Europe through the backdoor’ advice. Same goes for the Lonely Planet series. My friend likes to call them Rick-nicks. I visited Cinque Terre in July, 1997 as part of a Rick Steves tour. It was busy but not nearly as crowded as described here. Our meals were part of the package so maybe we were somewhat sheltered from the frenzy. Based on my brief time there, I’ve always considered Cinque Terre beautiful but not exactly quaint. I enjoy your travel writing and hope to see more of your adventures. I think I just have bad luck when it comes to these kind of things. My mother took us to Disney World a few years ago on the day after Christmas. We got there an hour after opening, and the park was already closed due to being at capacity. Who knew the days between Christmas and New Years were the busiest of the year? It’s been more than 10 years since we were there, but we stayed at a town just one stop further north on the train line from the big 5 and LOVED it (I wish I could remember what it was called). The beach was empty, we camped on a cliff overlooking the sea, no tourists to be found, even in July. We couldn’t hike the trails because it was July and the heat was too much but I’m sure November or a 4-day weekend in May (Pentecost or the like) would be perfect. My guess is that if you stay on the trails during the day, then return to the villages after 5pm (when the last boat leaves), the place would feel like a pleasant stop on the trail rather than a theme park. I’ve seen the Rick Steves Effect before, and I hate it. When I moved to Germany, I listened to a lot of Rick stuff and I grew to massively dislike the guy over the course of my travels. I still have a lot of respect for Rick Steves. I think he does a good job at educating people about the history and culture of areas. I have even used some of his clips on Florence for my Renaissance sections of World History. I would still buy his guidebooks over anyone else. But I do spend more time on Trip Advisor than Rick’s website. Unfortunately Europe is a small place, and most Americans have a small window of travel time opportunities. This leads to a ridiculous amount of American Rick-nics in one place at certain times a year. One friend said that he and his wife stayed in Vernazza in October once. They went to dinner at a restaurant that didn’t seem to full of guests as the season was waning. He looked around the room at some point and realized every couple/group had a Rick Steves’ Guide to Italy on their table. Yikes! As someone else pointed out, Rick is a good guy, but the problem with following his itineraries is that a million other people are doing the same thing. Feel free to disagree with him. My latest post is actually about a disagreement I had with Steve as well. I blog generally about travel and cross-cultural issues too and I’m always looking to connect with the greater community of bloggers who share similar interests. Drop by bosmosis.wordpress.com if you have a minute. Enjoy your travels and good luck finding the road less crowded. I’ve been watching a bunch of Rick Steeves since I’m headed to Paris next month. Thanks for reminding me about the mass of tourists I’ll probably run into. I’ve heard others give similar stories about Cinque Terre. YMMV but we went to Cinque Terre in mid-September and had mostly the quaint/cool experience that is described by Mr. Steves. It was about 10 years ago. We stayed at this place called Hotel Palme in Monterosso al Mare for 2 nights. It was OK, clean and adequate but nothing to brag about – we picked it mainly on price, ratings/reviews, and vacancy. None of Rick’s recommended lodging options were available, but I usually don’t agree with him on accommodations anyway (I’ll consider his suggestions but aggregate that info with Tripadvisor and recommendations from friends or bloggers I trust). I guess that is really my point – people who take his advice as 100% gospel on what to do may miss out on some neat experiences. His guidebooks contain a lot of good information but use them as one of many sources in deciding what to do according to your own interests. A lot has changed in 10 years, or so I am told. I use Rick also as an overview. Since we live in Germany, we get a lot of suggestions from friends on where to eat and where to stay. I rely a good deal on Trip Advisor as well. 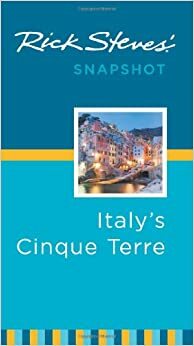 The point here is that I never knew Cinque Terra existed until I read Rick Steves Italy. I built it up in my mind as a perfect destination due to his description and the experiences my friends have shared; I tried to forget that it largely exists today because of tourist dollars. On the other hand we stayed a week in Pienza a few years ago. Rick calls it “too touristy” I found it to be tiny and quaint with few tourists. It was February, but beautiful and warm enough to sit in Sienna’s square without wearing a coat. I remember being trapped on a train with a guy who had a Rick Steves travel guide. It was the longest one-sided conversation / train ride of my life. You cannot blame Rick Steves, as you cannot blame Prometheus for global warming. I love Rick Steves, and one of my good friend works for him. Since you live in Germany, watch the weather and go last minute. Can you get a cheap flight to Pisa? I warn my tour members to beware of Germans with hiking poles on the trails 😜 and on the boat from Portovenere. Seriously though, the Cinque Terre is a hot spot for people from all over the world, not just Rick’s readers. The coast in Tuscany and Liguria has plenty of gems left that are easy to discover. Just get off the train at a different stop and ask at the TI or Pro Loco for hikes. Lots of great info here. I would go back to Camogli in a heart beat! We have travelled for years using Rick Steves as our travel guide. We always use the guide to research and book accommodations and take recommendations on where to go and when. We have also followed his recommendations on taking only a carry on bag. Not once have we ever been disappointed or steered wrong. We spent 3 days in Vernazza and loved it all. Our room looked directly out on the water and the beach. I’m sure you did not stay in Vernazza at peak of peak. I love Rick too. A good friend of mine works for him. And this isn’t so much a critique of him as it is me dreaming about a place that I heard about from Rick Steves and led myself to believe it was the perfect destination. The day I was there you literally couldn’t move through the streets. I blame Instagram and the millennials for the crowds. Everyone wants that super special pic to post on social media to make their friends drool. I’m going to Cinque Terre in June but we are staying in Portovenere, which should be less crowded. I will report back! We stayed in portovenere. Great little town. Parking is really expensive so be warned. Great food there as well. Read Beautiful Ruins before you go.